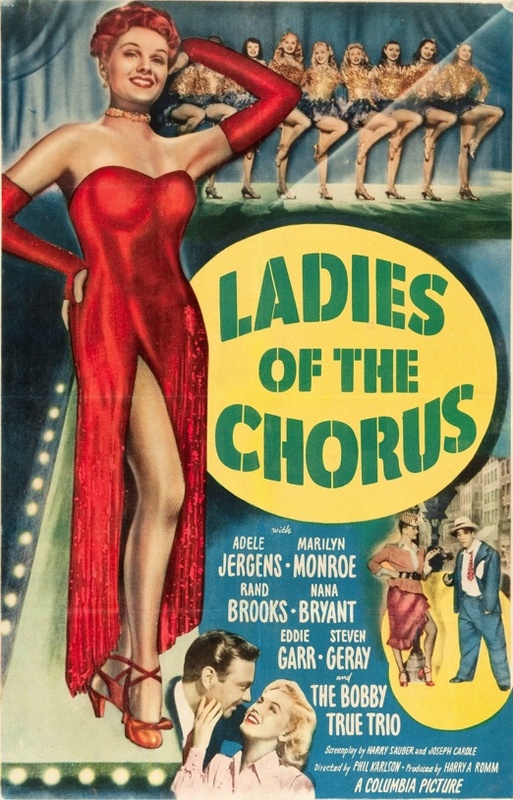 This review originally appeared earlier this year at Film Noir of the Week. Real-life married couples can have strange chemistry when they appear together in a film. For every Bogie and Bacall there’s also a Cruise and Kidman. Just because two actors want to tie the knot and spend the rest of their lives together (or in most cases, several years of their lives together before separating), it doesn’t mean their real-life chemistry will translate to the big screen. 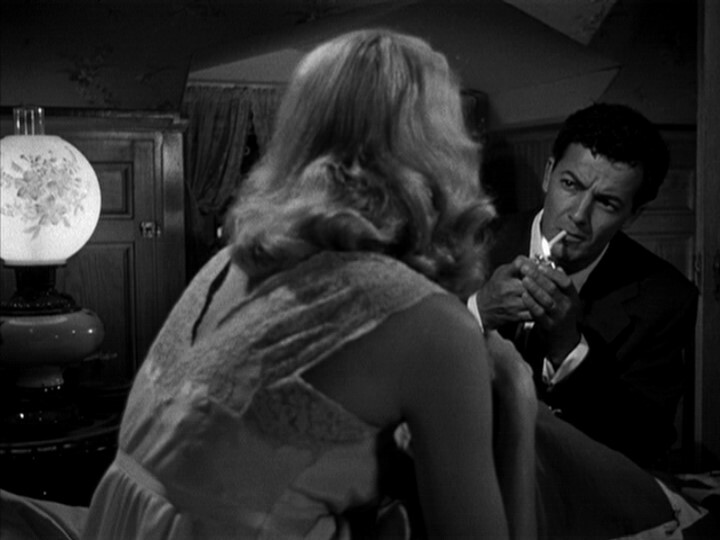 When Patricia Knight and Cornel Wilde starred together in Shockproof, they had been married 11 years. It was the only film they made together. 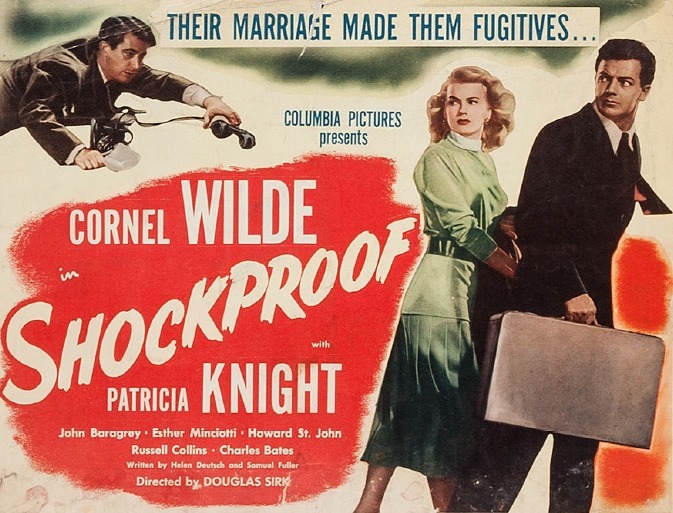 In Shockproof, Knight plays a woman named Jenny Marsh who has been paroled after a five-year stint in prison for murder. She committed the murder to protect her lover, Harry Wesson (John Baragrey). Jenny grew up in poverty, neglected by her parents, and the smooth-talking, wealthy Wesson swept her off her feet. The problem is, he’s a criminal through and through. Jenny’s parole officer, Griff Marat (Wilde), believes that all she needs is to spend time with normal, decent people, and she’ll straighten out her life. Griff is a “hands-on” parole officer, and he nominates himself (along with his mother and adorable kid brother) as the most suitable decent people for Jenny to spend time with, and his romantic notions carry the force of the law. As an actor, Wilde’s line delivery was never as impressive as his physique, but in his scenes with Knight he still comes off as the more seasoned thespian. Knight’s face is lovely in an angular sort of way, but her performance is the stuff of high camp. Whatever sparks existed in their real-life relationship, they’re hard to see in Shockproof. Shockproof was also an intersection for two men whose best work lay ahead of them: Samuel Fuller and Douglas Sirk. Sirk, the director of Shockproof, was born in Europe and made several films there before immigrating to the U.S. in 1941. He would go on to direct some of the most acclaimed American films of all time — the lush Technicolor melodramas Magnificent Obsession (1954), All That Heaven Allows (1955), Written on the Wind (1956), and Imitation of Life (1959) (which, to be technically nitpicky, was filmed in Eastmancolor, not Technicolor). At the time he made Shockproof, however, his Hollywood filmography amounted to a number of well-made potboilers that had a gloss of European sophistication; Hitler’s Madman (1943), Summer Storm (1944), A Scandal in Paris (1946), The Strange Woman (1946) (The Strange Woman was directed by Edgar G. Ulmer, but Sirk also did some uncredited directorial work on the film), Lured (1947), and Sleep, My Love (1948). Samuel Fuller, the screenwriter of Shockproof, was a newspaperman (he got his start as a copy boy at the age of 12), a pulp novelist, a screenwriter, a ghostwriter, and a veteran of World War II who had served with the 16th Infantry Regiment, 1st Infantry Division. Fuller would go on to become an acclaimed screenwriter and director of cult films like Pickup on South Street (1953), Shock Corridor (1963), and The Naked Kiss (1964). Shockproof is the only collaboration between Sirk and Fuller. Fuller’s screenplay was originally called The Lovers, and it told the story of a man and woman doomed by their love for each other. Deutsch’s rewrite makes the entire film feel pointless, since it undercuts all of the ethical lines that Griff crosses because of his love for Jenny. 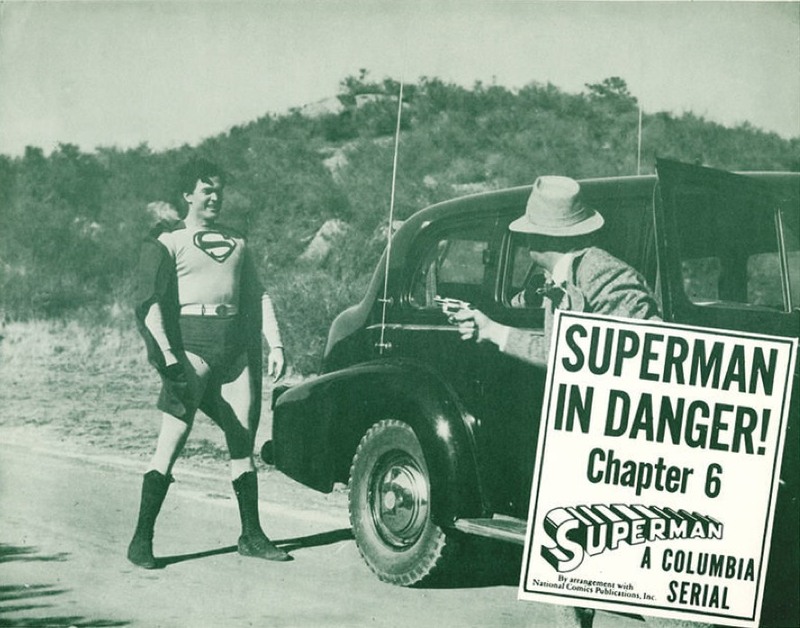 It also neuters any sense of doom or tragedy that was present in Fuller’s original script. Even the change of title from The Lovers to Shockproof feels wrong. The term “The Lovers” recurs throughout the film, and it’s what Griff and Jenny are dubbed by the tabloid press. What does “Shockproof” even mean in the context of this film? Even though Sirk and Fuller never met, Shockproof has Fuller’s fingerprints all over it. It’s a choppy, uneven film, but like everything that Fuller wrote, there’s a nasty passion always bubbling beneath the surface. It doesn’t matter so much why people are doing things, just that they’re doing them and going for broke, pedal to the metal, damned and proud, racing toward oblivion. Of course, to pull this off successfully a film needs to have actors who are utterly convincing no matter how contrived their actions are, as well as a script that has the courage of its convictions. Unfortunately, Shockproof has neither of these things, and while there is much that’s good about it, ultimately it’s an interesting failure. Posted in 1949, January 1949 and tagged Columbia Pictures, Cornel Wilde, Douglas Sirk, Film Noir, Helen Deutsch, John Baragrey, Patricia Knight, Samuel Fuller. Bookmark the permalink. I listen to radio shows. A lot of radio shows. I’ve amassed a large collection over the years, and each radio show is identified by date broadcast so I can listen to them on the same day of the week they were originally broadcast, and on roughly the same date. (For 64 years ago, you add 3 to the day’s date.) I have enough old-time radio shows on MP3 that I’m rarely able to listen to all of each day’s programming, which is fine — in the ’40s no one listened to everything, and I’m sure plenty of people missed their favorite shows if they were out for the evening. Currently, the shows from 64 years ago that I hate to miss include The Adventures of Sam Spade with Howard Duff and Lurene Tuttle, Suspense, The Whistler, The Great Gildersleeve with Harold Peary, and The Adventures of Philip Marlowe with Gerald Mohr. I have plenty of episodes of Boston Blackie downloaded, but most weeks it’s not a show I go out of my way to listen to. On the other hand, whenever I do listen to it, I have a good time. I feel the same way about both Boston Blackie movies I’ve seen — Boston Blackie and the Law (1946) and this one, Trapped by Boston Blackie (1948), which was directed by Seymour Friedman and released by Columbia Pictures — it wasn’t on my “must watch” list, but I taped it when it was on TCM a few months ago, and I had a good time watching it. The film version of Boston Blackie doesn’t make quite as make puns and wisecracks as his radio counterpart, but they’re both smooth-talking, distinguished gentlemen who still have a streak of criminality, despite being mostly reformed. 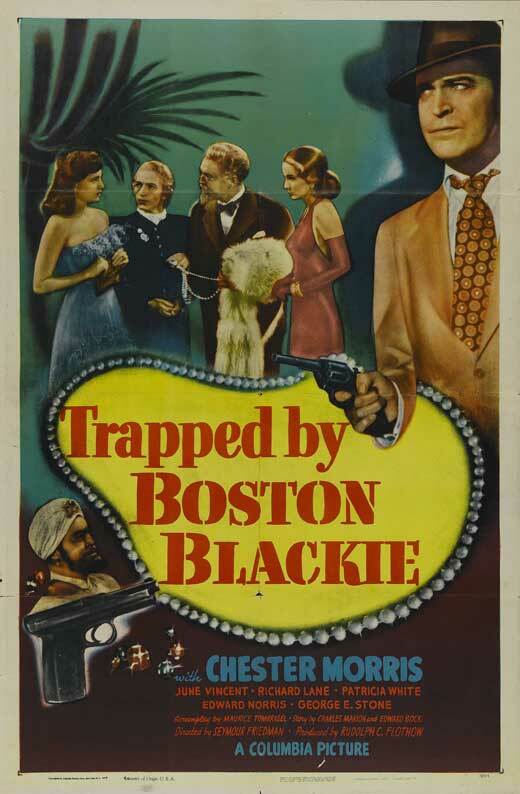 In Trapped by Boston Blackie, Blackie and his weaselly sidekick, “The Runt” (George E. Stone), are hired to protect a valuable pearl necklace at a high-society party, but it goes missing from under Blackie’s nose, and he and The Runt are the prime suspects. Blackie spends most of the film’s running time wearing some kind of ridiculous disguise. First he dresses up as an Eastern mystic in order to circulate freely around the party and keep an eye on the necklace (and kids, when Blackie examines his costume before putting it on and holds up the turban and exclaims “Gay!” it doesn’t mean what you think it means). Later, in order to track down the necklace, Blackie disguises himself as a fussy old man with The Runt in drag as his wife. (The Runt uses his old-lady disguise as an excuse to give a pretty young woman played by Patricia Barry a creepy and overly familiar hug.) Later, Blackie affixes a fake mustache to his upper lip and passes himself off as an insurance investigator. And of course he’s dogged all along the way by his arch-nemesis and sorta-pal, Inspector Farraday (Richard Lane), who’s assisted by the extremely dim-witted Detective Sergeant Matthews (Frank Sully). Trapped by Boston Blackie is not the first mystery programmer from Columbia Pictures I’d recommend if you’ve never seen one before, but if you’re a fan of the Boston Blackie series, it’s solid good fun. Posted in 1948, May 1948 and tagged Boston Blackie, Chester Morris, Columbia Pictures, Frank Sully, George E. Stone, June Vincent, Mystery, Patricia Barry, Richard Lane, Seymour Friedman. Bookmark the permalink. Brick Bradford is the worst of the three Columbia serials produced by “Jungle” Sam Katzman that I’ve seen so far, and that’s saying something. 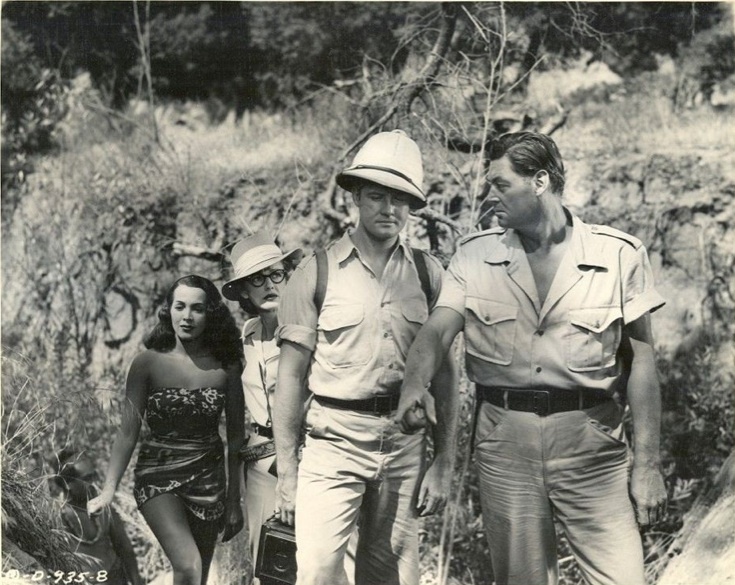 The previous couple of Katzman-produced serials I watched — Jack Armstrong and The Sea Hound (both made in 1947) — suffered from a similar lack of focus across their 15 weekly chapters, but Brick Bradford takes it to a new level by setting up a tantalizingly trashy science-fiction scenario and then abandoning it halfway through. Brick Bradford was directed by Spencer Gordon Bennet and Thomas Carr and based on the daily newspaper strip created by writer William Ritt and artist Clarence Gray that began in 1933. Brick Bradford was a square-jawed, spacefaring, time-traveling adventurer in the mold of Buck Rogers and Flash Gordon. 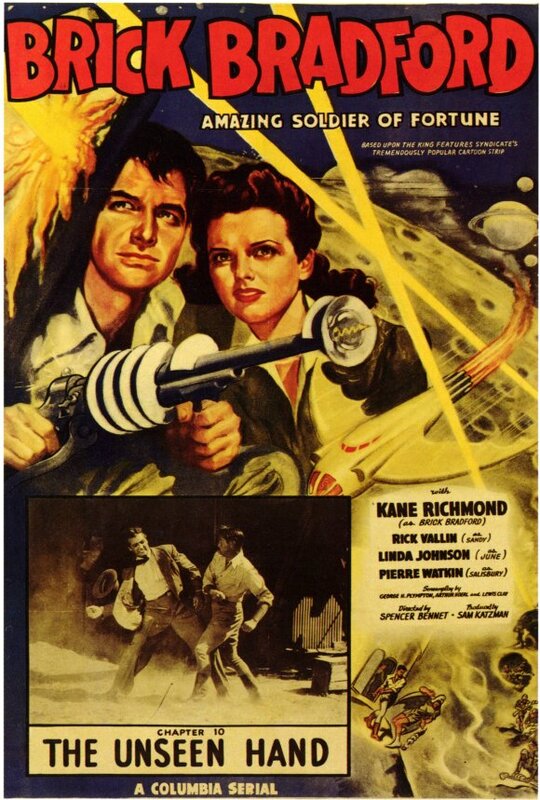 He’s played by serial superstar Kane Richmond, who also starred in Spy Smasher (1942), one of my favorite serials, and as Lamont Cranston, a.k.a. 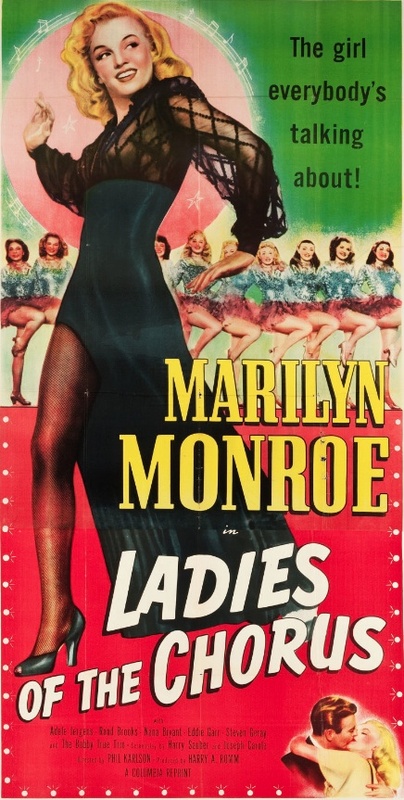 The Shadow, in The Shadow Returns, Behind the Mask, and The Missing Lady (all 1946), as well as innumerable other B movies and chapterplays over the course of his career. When he appeared in Brick Bradford he was pushing 41, and he would only appear in one more film before retiring from acting — William Nigh’s Stage Struck (1948). Richmond is definitely not the problem with Brick Bradford. He still looks great and can carry himself in a fistfight. The problem is that it leaves so many plot threads hanging at the end. Chrome-domed, bespectacled scientist Dr. Gregor Tymak (John Merton) invents an “interceptor ray” that could be used to shoot down atomic weapons, but that could also be easily tinkered with and made into a terrifying weapon. Definitely not something that should fall into the wrong hands. Tymak has also invented a “crystal door” that can be used to move through space and time, or through what Tymak calls “the fifth dimension.” He uses it to travel to the far side of the moon, which no one has ever seen before. Despite what you may have heard, the dark side of the moon is as bright as high noon in California, has a breathable atmosphere, and is the perfect place to mine “lunarium.” It also has plenty of moonhabitants, who are mostly overweight middle-aged men with capes and Centurion helmets. Unsurprisingly, producer Katzman’s vision of life on the moon isn’t too far removed from his vision of life in the jungle, but I felt like there was some cheesy good fun to be had on the moon with the evil dictator Zuntar (Robert Barron) and his queen Khana (Carol Forman), and their war against the “exiles,” a group of scientists from the earth who were able to reach the moon and form a utopian civilization. 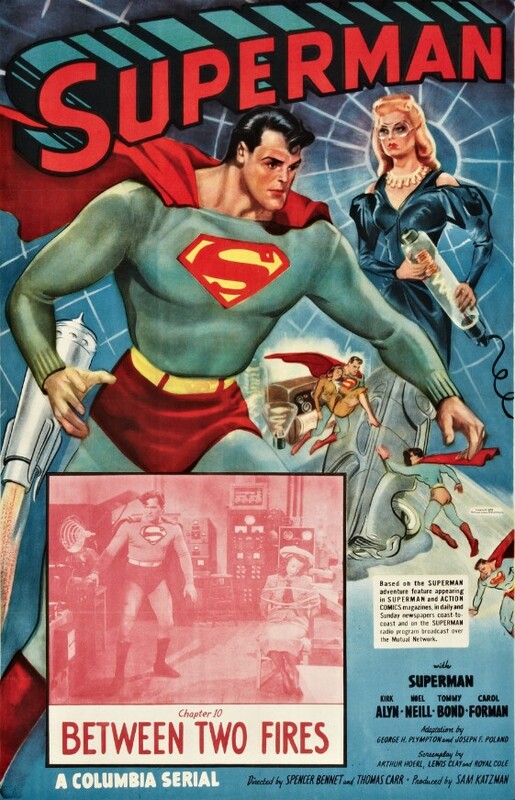 For the first half of Brick Bradford, Brick and his sidekick Sandy (Rick Vallin) travel back and forth to the moon through the crystal door, battling the evil super spy Laydron (Charles Quigley, the hero of the 1946 Republic serial The Crimson Ghost) on terra firma and Zuntar and Khana in orbit. In chapter 8 of the serial, however, Brick and Sandy use Tymak’s experimental “Time Top” to travel from 1948 America to 1748 Brazil and team up with pirates to find some secret plans Tymak hid in the past among some buried treasure. This diversion is mercifully brief, but when it’s over there is literally not one more mention of the moon or anything that happened on it. There’s some fun stuff with Tymak’s “Z-ray machine,” which is worn around the neck like a tourist’s camera (Tymak explains that the Z-ray “creates the illusion of invisibility, just as the mirror reflects the illusion of form”), but aside from that the last five chapters of the serial are a boring collection of fistfights and cliffhangers in and around Tymak’s farmhouse in the California countryside. It’s standard serial stuff, and I probably wouldn’t have found it so frustrating if I hadn’t spent every minute wondering what was going on up on the moon. Imagine if a Flash Gordon serial introduced Ming the Merciless in the first several chapters and then completely forgot about him for the climax! 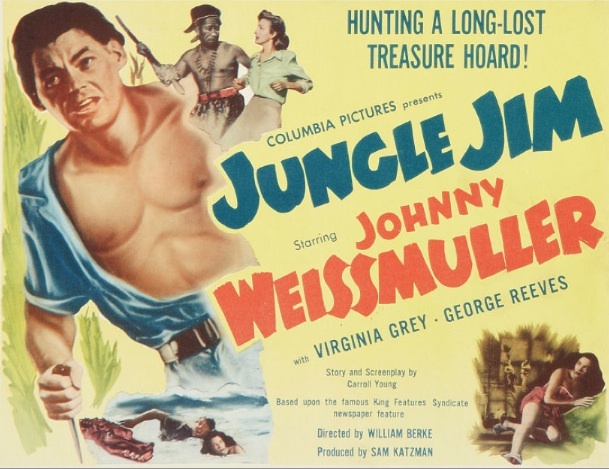 Posted in 1948, April 1948, February 1948, January 1948, March 1948 and tagged Action-Adventure, Charles Quigley, Columbia Pictures, John Merton, Kane Richmond, Linda Johnson, Rick Vallin, Sam Katzman, Science Fiction, Serials, Spencer Gordon Bennet, Thomas Carr. Bookmark the permalink. 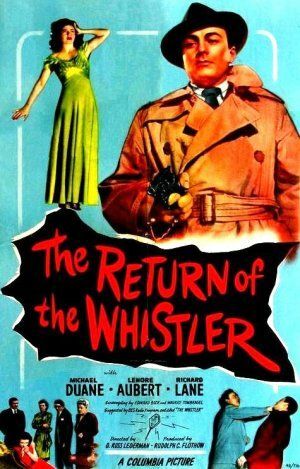 The Return of the Whistler was the final entry in the Columbia Pictures series based on the CBS radio show. It’s the only Whistler film that doesn’t star Richard Dix, who was in poor health when it was made (he died on September 20, 1949, at the age of 56). Not only were the Whistler films excellent B-movie programmers, they were remarkably faithful to their source material. Just like the radio show, The Return of the Whistler begins with the eerie whistled theme music. The camera tracks the shadow of a walking man as he narrates in voiceover: I am the Whistler, and I know many things, for I walk by night. I know many strange tales hidden in the hearts of men and women who have stepped into the shadows. Yes, I know the nameless terrors of which they dare not speak. Michael Duane and Lenore Aubert star as Ted Nichols and his fiancée Alice, who — when the film begins — are driving through a dark and story night to be married by a justice of the peace. Alice is a Frenchwoman, and Ted has only known her for two weeks. He found her under mysterious circumstances, limping through the woods near his summer cabin, running away from someone or something. There’s a lot about her past that he doesn’t know, but he does know one thing — he loves her more than anything in the world. Naturally, things don’t go according to plan. 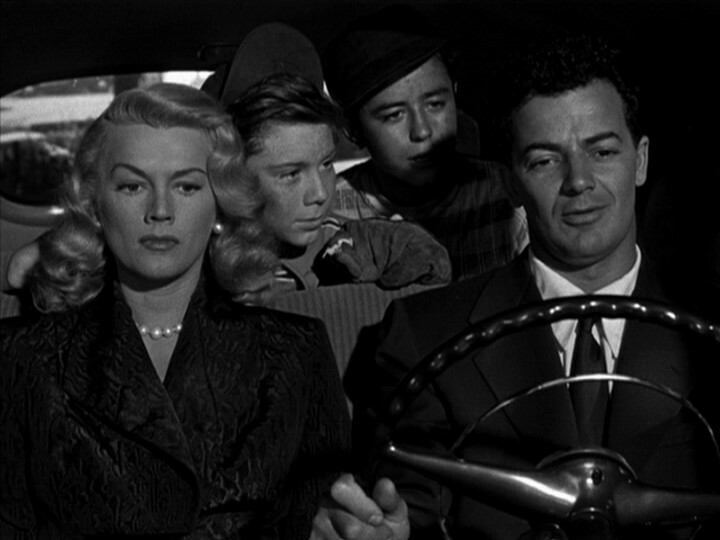 First their car breaks down, then they discover that the justice of the peace is out of town, trapped by bad weather. Ted and Alice can’t stay in a hotel room together for the night because they aren’t legally married yet, so Ted leaves Alice at the hotel alone and walks to a nearby garage to have his car fixed. The shadow of the Whistler follows him. This isn’t just the way you’d planned your honeymoon is it, Ted? But don’t be too unhappy, it’s only a few more hours before you and Alice will be united forever. Like most things the Whistler says, those words drip with sardonic irony, because when Ted returns to the hotel the next morning Alice is gone, and the cranky night clerk (played by Olin Howland) claims not to know anything. The Return of the Whistler is a fine capper to the series. The pacing is excellent and the actors all turn in solid performances. The mystery of what happened to Alice isn’t attenuated unnecessarily, and the movie is more suspenseful because of it, getting us involved in her predicament and Ted’s desperate fight to find out what’s going on before it’s too late. Posted in 1948, March 1948 and tagged Ann Shoemaker, Columbia Pictures, Cornell Woolrich, D. Ross Lederman, Film Noir, James Cardwell, Lenore Aubert, Michael Duane, Mystery, Richard Lane, Rudolph C. Flothow, The Whistler. Bookmark the permalink.